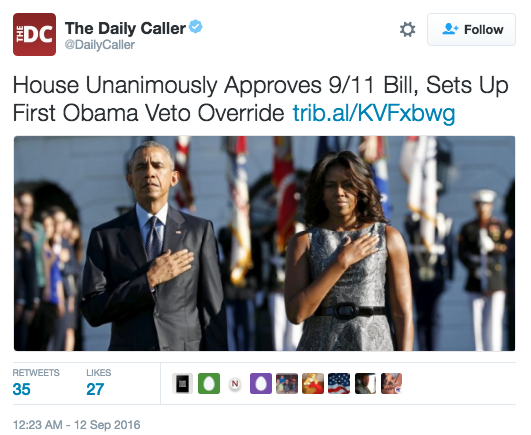 Today the White House confirmed that President Obama plans to veto legislation passed by both the U.S. House and the Senate that would allow families of 9/11 victims to sue Saudi Arabia through the U.S. court system. Family members issued a letter to President Obama on Sunday, September 15th stating that they intend to sue Saudi Arabia to “help to deter state-sponsored terrorism.” The state-sponsored terrorism allegations stem from several pages from the now infamous “28 pages” document that show several September 11 Hijackers were in contact with and received support from individuals connected to the Saudi government. Page 417 shows two 9/11 hijackers received cash from a member of the Saudi Royal Family. Several other pages also link hijackers to various members of the Saudi Royal family or members of the Saudi government. Though the bipartisan bill was passed in both chambers of Congress, White House Press Secretary Josh Earnest told reporters during a daily press briefing Monday that Obama is holding steadfast to his opposition to it and will likely issue a veto. “The president believes that it’s important to look out for our country, to look out for our service members, to look out for these diplomats and allowing this bill to come into law would increase the risk that it would face,” he continued. Earnest also conceded the “political potency” that the veto could possibly be overridden, though Congress has yet to successfully override a veto during Obama’s time in office. Though in the past Earnest has hinted at the fact Obama would likely veto the legislation, his comments today were the greatest confirmation he has offered thus far.